Providing Rewarding Arts for All Ages and Abilities. Simply ArtAble’s mission is “to provide rewarding arts programming for people of all ages and abilities.” Simply ArtAble provides quality visual arts education for and employment to individuals with cognitive, developmental, and physical disabilities as well as those struggling with mental illness, in a space adapted to their needs. 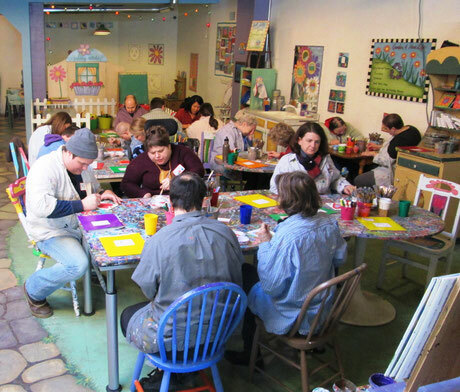 The studio was founded in 2007 by professional muralist and LHUCC member, Jane Elias, and operated as Simply Jane Studio, LLC until 2012 when it became a 501(c)(3) non-profit and was renamed Simply ArtAble (rhymes with “table”). On becoming a nonprofit, ramps, automatic door openers, accessible restrooms, and adjustable art tables were installed in the studio, making it fully ADA compliant. Members of LHUCC contribute financially and volunteer their time and talent to Simply ArtAble. Volunteers help with birthday parties, answer the phones, provide bookkeeping support, and attend our Pizza Paint Parties as a “paint buddy”. 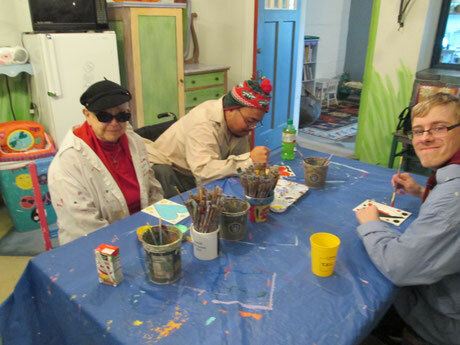 Pizza Paint Parties are 2-3 hour painting class/ social events, held monthly, where day program participants, group home residents, and others with disabilities learn to paint while socializing with individuals from the broader community. Often, persons with disabilities live an isolated life, spending their days primarily with others from their own community, with few opportunities to socialize and engage with the general population. Our Pizza Paint parties provide this opportunity. 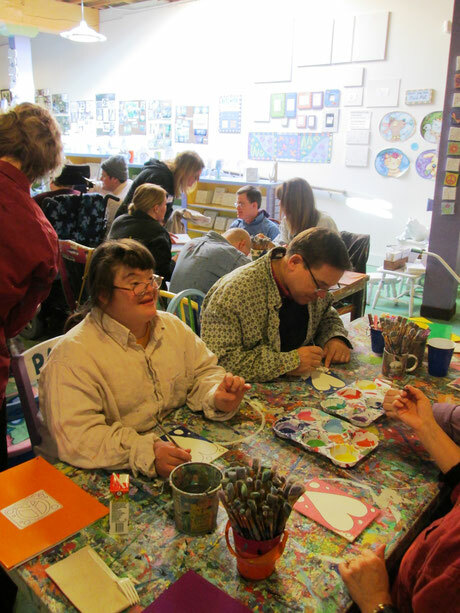 Each person with a disability is paired with a typically-abled “paint buddy” who assists, as needed, with their painting and engages in conversation. And of course, the day program participants are not the only ones who learn and grow and benefit from this experience. Our volunteers – or “paint buddies” – find the experience incredibly rewarding as well. The one-on-one personal connection of creating art together creates a bond between participants, increasing their understanding of each other and their worlds.